Meg's Food! 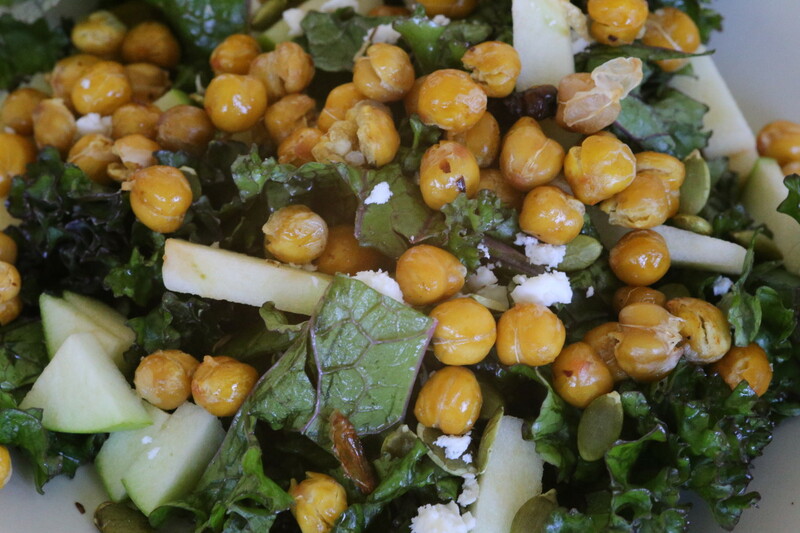 | Crunchy Apple Kale Salad - Meg's Food! This salad has is everything you’ve been craving right now. These gorgeous, crisp days are my favourite of the year. I wish fall weather lasted months and months. But in Canada, we only ever get a few weeks of glorious crisp days before winter takes over. That means you need to make the most of it! 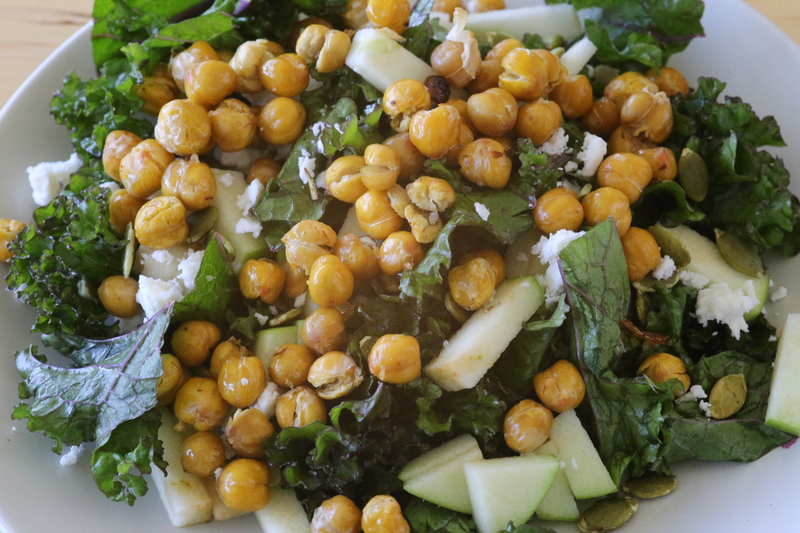 And crisp sunny days call for a crunchy salad like this. I am so into this salad. It has so many different elements and they all come together so nicely. Start with massaged kale, of course. Perfect for a weekday lunch, since you can make it Sunday and munch on it all week. Throw in crunchy granny smith apples, for sweetness and a taste that is oh-so-autumnal. Then top with crunchy roasted chickpeas, pumpkin seeds, and feta. 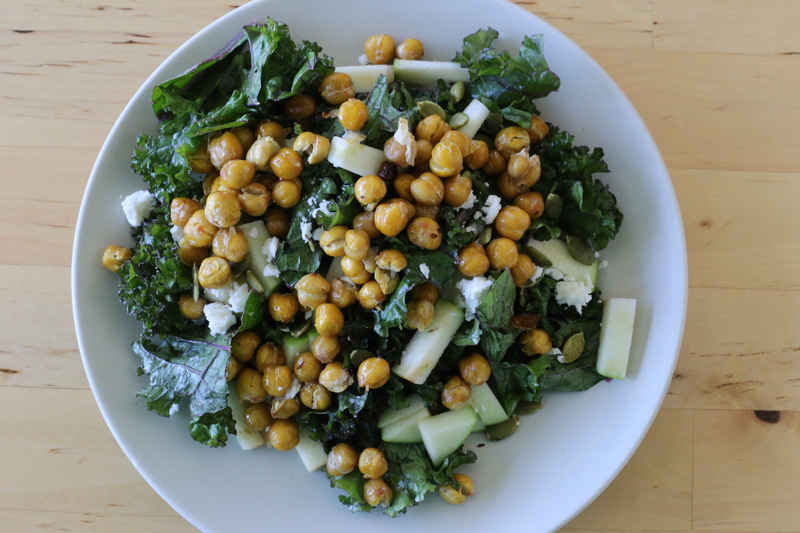 Because you massage the kale with lemon juice and olive oil, you don’t even really need a dressing for this salad. But of course, a honey lemon vinaigrette makes it even better. Roughly chop kale and put in a large bowl. Drizzle with some olive oil, season with salt and pepper, and squeeze the juice from one lemon over top. Massage into kale until leaves become tender and bright green. Divide among four plates. Meanwhile, preheat oven to 375. Dry chickpeas between paper towel and throw onto a baking sheet lined with parchment paper. Season with salt and pepper, drizzle with olive oil, and sprinkle with dried rosemary and chili flakes. Roast 40-45 minutes, tossing every 15 minutes or so, until nice and crispy. 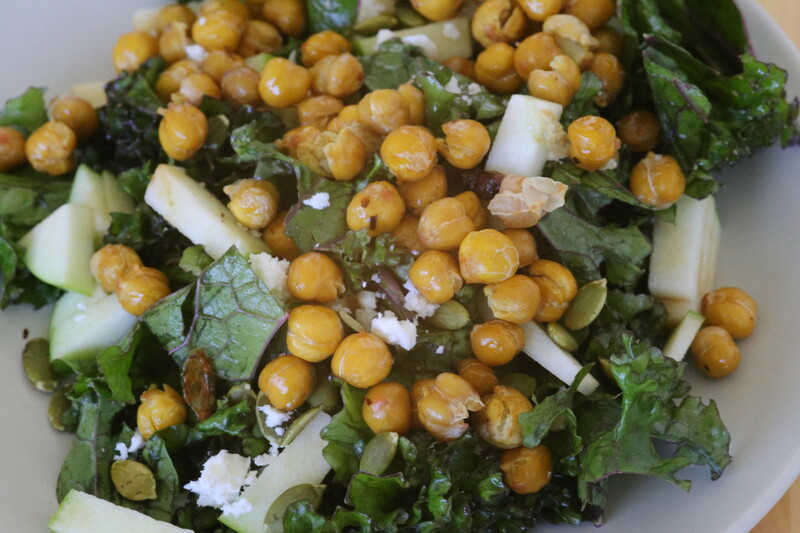 Top kale with roasted chickpeas, diced apples, crumbled feta, and pumpkin seeds. To make dressing, whisk honey with the juice from the second lemon. Whisk in olive oil. Season with salt and pepper. Drizzle over salad. This entry was posted in Dinner, Lunch, Salad and tagged apple, chickpeas, fall, feta, kale, october, salad. Bookmark the permalink.